Whenever I’m dealing with more stress than normal it always shows up on my skin in some way, be it in the form of spots, dry patches, or even the occasional rash. 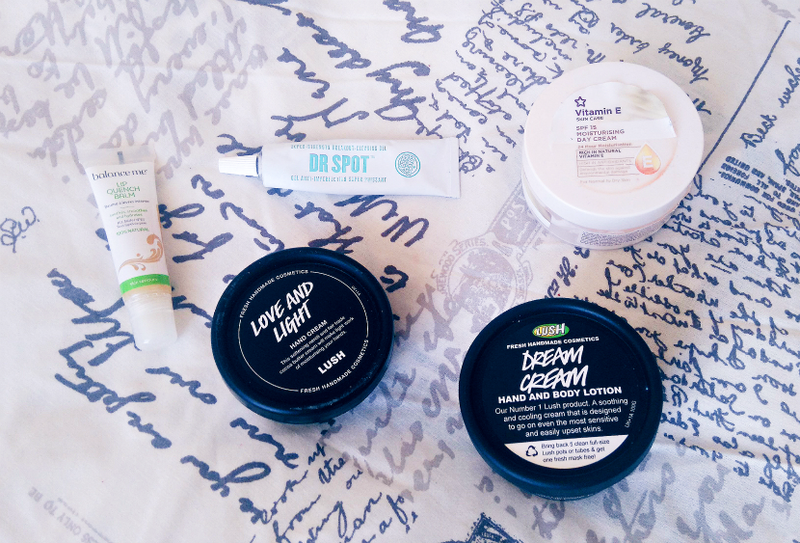 Fortunately I’ve built up a rather wonderful little arsenal of products that care for my skin and calm it down, so I thought I’d share some of them with you today. I’ve been holding out for a cruelty-free alternative to the Nuxe Reve di Miel balm for a while now, so when Beauty Expert asked me if I’d be interested in trying the new Balance Me Lip Quench Balm of course my answer was yes. The Lip Quench Balm is free from petroleum, which is wonderful because although petroleum (a common ingredient in lip care products) creates a barrier between the skin and the elements it doesn’t offer any actual moisture. This balm moisturises your lips using shea butter, cocoa butter, and mango butter and I find it very hydrating without being too gloopy or thick (although you might want to give it a moment to sink in if you’re applying lipstick over the top). The spearmint oil adds a lovely fresh scent too, and the tube is easy to carry around for re-application throughout the day. I use a prescribed cream to treat my acne but when I ran out earlier this year I picked this up to tide me over and was very impressed. While it doesn’t quite have the strength of my prescription cream it does contain salicylic acid and witch hazel, both excellent spot-busters, and it calms aggressive spots with continued use. Soap & Glory claim that you can apply it whenever you need to throughout the day but it does that thing that literally every single spot treatment does and goes tacky when it dries — I’d stick to using it early in the morning (if you have time) and in the evening after you’ve taken your make-up off. I do love a good hand cream, and this one is gorgeous. Two of its major ingredients are jojoba oil and cocoa butter, so it’s incredibly moisturising and leaves hand silky soft, and the neroli oil and Brazilian orange oil give it a fresh herbal scent. The tub means it’s probably more practical to use at home than on the go but Love and Light is definitely one to keep around. A cheap and cheerful daily moisturiser that comes into its own during the winter months. Superdrug’s Vitamin E Day Cream is incredibly kind to skin, and you only need a little bit at a time. It has quite a thick texture but it doesn’t feel too heavy first thing in the morning (best to let it sit for a bit before you get going with make-up, though). Best of all, it provides the gentle moisture that dry, flaky skin needs. I haven’t tried this on my hands (although I imagine it’s wonderful) but my word this is a godsend if the skin on your body is easily-irritated. The scent is not for everyone — it contains lavender — but try and look past that if you can. The primary ingredient of Dream Cream is oat milk and oats contain antihistamines, which calm down the skin, and the lotion feels really cool when you apply it. Somehow, this manages to be the most hydrating lotion I’ve ever used and the lightest. True love. What are your go-to products when your skin needs a little love? Have you tried any of these? Let me know in the comments!